There are certain consistencies observed in nearly every SIBO (Small Intestinal Bacterial Overgrowth) patient: bloating, abdominal discomfort, constipation and/or diarrhea, possibly beaching or reflux, the list goes on. Yet each SIBO case is also uniquely different, in both presentation and response to care. Here are some observations of the SIBO patient’s return to health. Wouldn’t it be great if everyone who came in with SIBO just got better and better every day until they were completely well? 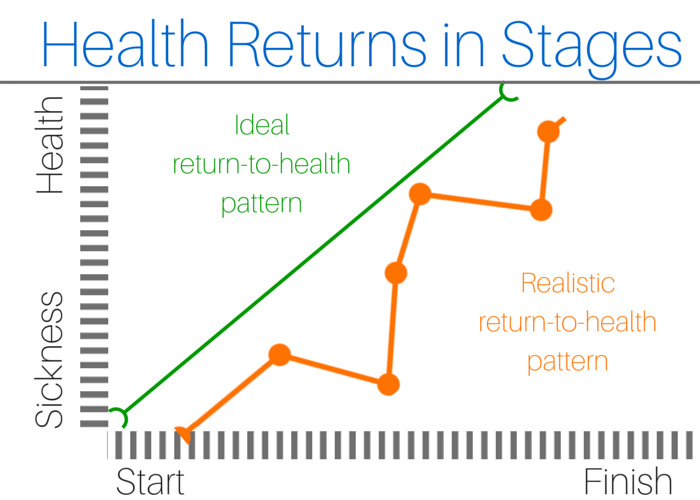 That’s still my goal, but until that day comes I remind my patients that health returns in stages. Some days will be good. Some days will be great, and you’ll think you’ve got this handled. And then all of a sudden, for no apparent reason, you could have a bad day. It happens. But knowing so ahead of time helps avoid discouragement and gain gratitude for the good days! In school, we doctors learn that this is how it works: the patient comes in with a set of symptoms, that set of symptoms equals a particular diagnosis, there is a predetermined treatment for that diagnosis that is recommended to the patient, the patient follows through and gets well. But let me tell you, it rarely goes this way. Here’s a more realistic look: the patient comes in with many common symptoms combined with bizarre things we’ve never heard of, we do our best to create an appropriate approach to helping the patient, the patient does some or part of the program and hopefully gets well but there are usually issues that pop up and need troubleshooting. Some protocols need adjusting, some patients require a different approach, some just need to go slower or faster than expected. That’s where the skill and experience of the practitioner comes into play. I remember the first SIBO patient I worked with. I got her on the SIBO Diet and set up with supplements and within the first day she reported wild improvements. Even I was amazed. But considering the stage of her SIBO (she suffered for over a decade), I knew there was no way it could be gone so soon. I encouraged her, as I do all my patients, to continue on with the program and as I expected, many of those bizarre symptoms began to go away with time too. Everyone, I’ll admit that I include myself in this category, wants the magic pill that takes away the suffering and lets us eat whatever we want. If the body worked in such a way that food choices played absolutely no role in health outcomes, I’d be all for that, but it simply isn’t true. 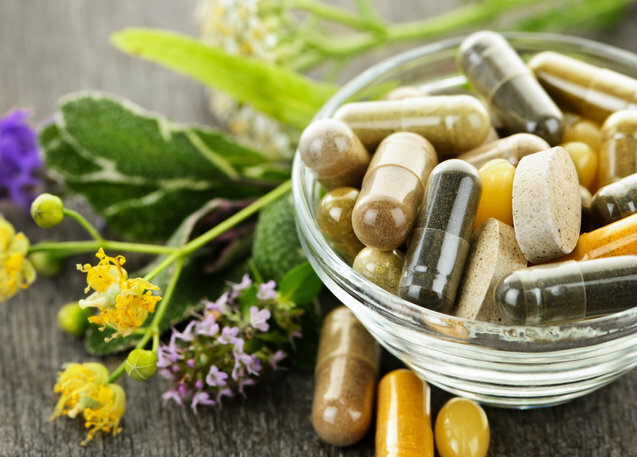 The supplements are fantastic at doing their job, but part of the program involves eliminating foods that cause bloating and fermentation in the gut. As long as bloating is still an issue, bacteria from the colon can translocate up into the small intestine and reinfect you. That cycle must be broken in order for your body to fully heal. 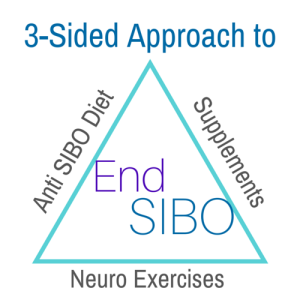 I use a Three Sided Approach to Overcoming SIBO that includes Diet, Supplements and Neurological Exercises when required. Although all three components are presented at once, it seems that some patients like to pick and choose only those pieces that they want to implement. They’re open to taking supplements, but tell me “I’ll start the enzymes next month.” They do the diet, but then tell me what they “got away with eating.” They refuse or forget to the do the neurological exercises altogether. And I get it! It’s a lot to take in. For some, it can be a major life change. 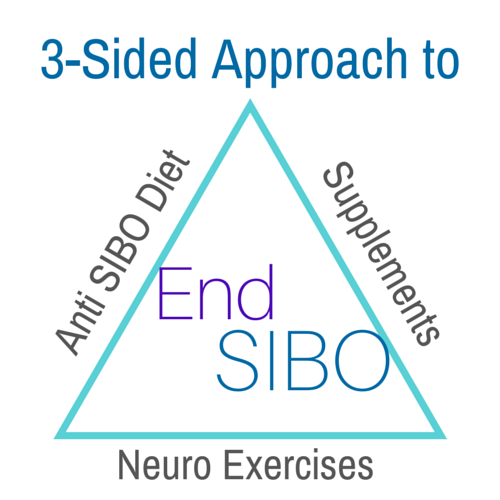 But consistently I have seen that the patients who do go all in, who commit to all of it from day one, get the best results, heal sooner and move on to their new SIBO-free life more quickly. 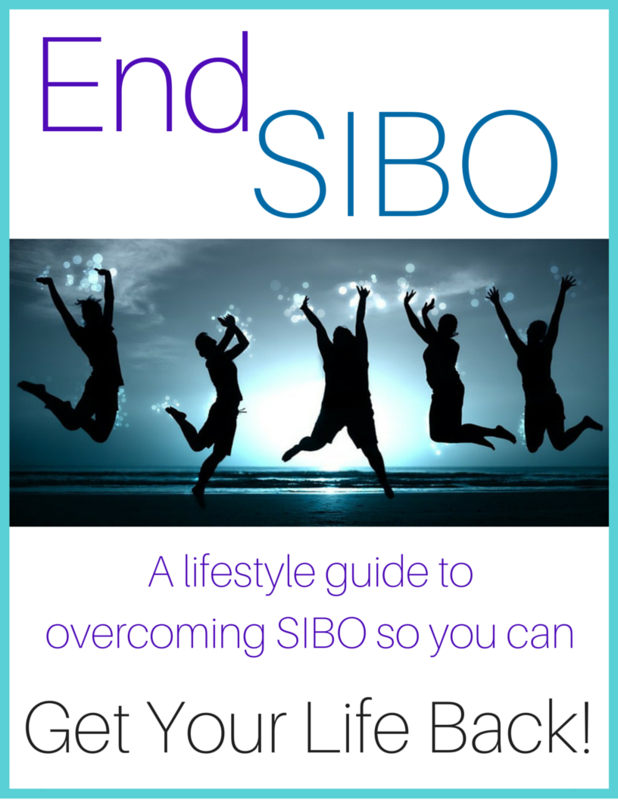 The way I see it, if you’re going to bother temporarily rearranging your life to overcome SIBO, you might as well do everything you can so you can get through it as quickly as possible. Every day you mess around is another day you still have SIBO. But every day you stick with the program is another day closer to being SIBO-free! I see that onions and garlic should be avoided, does that mean onion and garlic powders as well? When I do start feeling better and no longer feel bloating and GI issues, how long should I wait to start reintroducing food? I know each body is different, but on average, how fast do your patients heal when following this diet? I typically have people avoid the onion and garlic powders initially. This can be 6 week, 6 months or more depending on how the body is responding. But I also incorporate a full digestive support approach to healing, so it is not based on diet alone. Eliminating inflammatory foods such as gluten, dairy, soy, corn, often times egg too will help anyone’s digestion improve. Then with the SIBO patient, eliminating fermentable food, known food triggers, sometimes certain difficult-to-digest proteins can also be beneficial for a short time. You need to give the digestive tract a break, feed it healing and soothing foods so it can recover. But keep in mind that the target is to add foods back, incorporating as wide of a variety of foods as possible, as quickly as is tolerated. A diverse diet will support a robust microbiome which will improve overall health and digestion. I just wanted to say, I am so grateful to find a website that offers a little hope regarding a SIBO diagnosis. I was just diagnosed after 5 years of suffering and I’m also 9 weeks pregnant. I can’t do anything in the way of treating it right now other than diet. I’m losing so much weight and can barely manage to get off the couch, so I’ve been doing nothing but research and the lack of success stories is seriously depressing. It’s nice to read that healing is possible in time. Hi Amber, I’m so glad to hear you found it helpful. Wishing you the best!